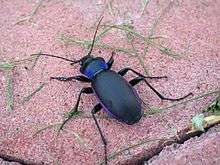 Carabus violaceus, sometimes called the violet ground beetle, or the rain beetle is a nocturnal species of a beetle, from a family Carabidae. The violet ground beetle is a shiny, black beetle that has violet or indigo edges to its smooth, oval elytra (wing cases) and thorax. Adult beetles are usually 20–30 mm (0.8–1.2 in). Adult beetles do not fly. The species could be found throughout Europe, and Japan. The species can be found in forests, parks, and gardens. They are nocturnal. Both adults and larvae feed on slugs, snails, worms and insects (presumably weevils). 1 2 3 "Carabus violaceus Linne, 1758". Bumblebee. Retrieved 15 June 2012. ↑ "Carabus (Megodontus) violaceus Linne, 1758". 2.6. Fauna Europaea. April 9, 2013. Retrieved May 17, 2013. Wikimedia Commons has media related to Carabus violaceus.